Yellow Chair Review is an inclusive, quarterly online literary arts publication, passionate about supporting marginalized voices. While their main love is poetry, they also accept flash fiction, non-fiction, art, and reviews. They are open to any variation of these forms as well. Also, Yellow Chair Review runs a weekly poetry challenge entitled “Rock the Chair” where poets can submit one poem each week “to compete against others for space on Yellow Chair Review’s blog.” Turnaround time is super quick, they’ll get back to you the next day! More info below. I wondered how and why this lit mag came to be, so I asked Yellow Chair Review editor Sarah Frances Moran a few questions to find out. See my interview with Moran and a link to their submission guidelines below. HOPKINSON: Tell me a little bit about Yellow Chair Review. 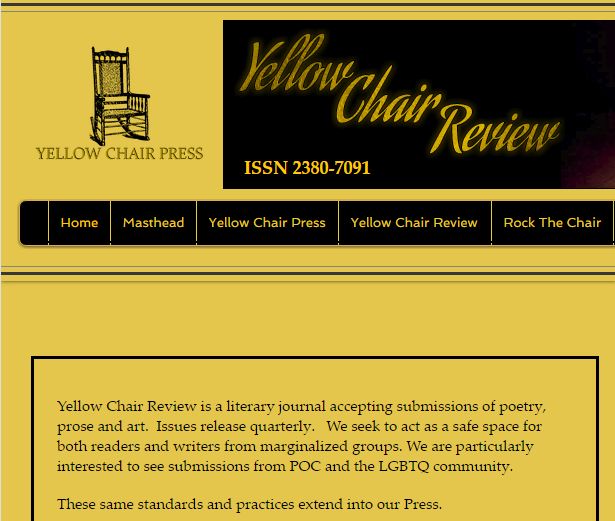 MORAN: Yellow Chair Review is an online literary journal accepting submissions of poetry, prose and art. We release our issues quarterly and have the occasional “special issue” that will release as we announce them. We seek to act as a safe space for both readers and writers from marginalized groups. We are particularly interested to see submissions from POC and the LGBTQ community. HOPKINSON: How/why was Yellow Chair Review originally started? MORAN: I wanted to create a space that was diverse, inclusive and that responded quickly. I did some research on what I needed to do to get started and what was expected of me and then just went with it. Brainstormed some names, some guidelines and went to work on it. It’s grown so much. I never expected that. MORAN: Emotional work. I think that’s the best way to describe what I’m drawn to. The poem or the story that leaves it all out there whether it’s about love or death, Batman or philosophy. I’m not as interested in work that is simply descriptive unless in that description the roots of emotion grow. MORAN: Tinderbox Poetry Journal, Winter Tangerine, Amethyst Arsenic,The Offing, The Acentos Review, Crab Fat Magazine… there are so many great ones I could go on forever. MORAN: Any questions can be sent to yellowchairreview@gmail.com. I’m typically pretty prompt with responses. NOTES: No simultaneous submissions, wait six months to submit again once you’ve won. Where to Submit in Nov 2016 by Entropy (filtered for no fee only! )–the list of all lists!